Mandate Trade Union’s Dunnes Stores National Disputes Committee has today (Tuesday, 10 March) announced an initial one day strike to take place on Holy Thursday, 2nd April 2015 with a review thereafter. The Committee, which consists of ten Dunnes Stores workers, said the one day strike would go ahead in 107 stores across the Republic of Ireland unless senior management in the Company agree to a meeting with the workers through their trade union in order to discuss all of the issues in dispute. Last week Mandate Trade Union, which represents the majority of the 10,000 workers in Dunnes Stores, announced that more than two thirds of their members had balloted in favour of industrial action. 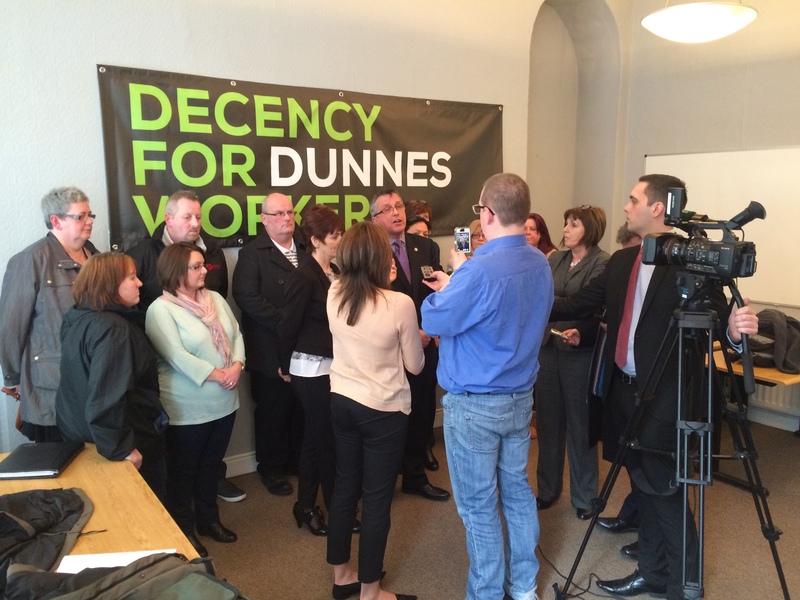 The Dunnes workers are now reiterating their call for their employer to resolve this dispute as a matter of urgency. The implementation of banded hour contracts which would give workers security of hours and earnings. A review of Dunnes’ excessive use of temporary contracts of employment. Individual and collective representational rights for Dunnes workers.